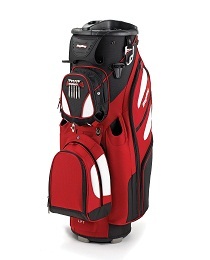 Here are some more neat gift ideas for a father who plays golf. The Nexbelt belt is different, it has no holes. Adjustments are in 1/4″ increments so you don’t even have to know waist size exactly since Dad simply cuts and fits it to him. There are two standard lengths 28 to 40″ and 38 to 50″ and the belt buckle even holds a hidden ball marker. Nexbbelt comes in several designs all made of quality leather for $54.99. Since Father’s Day is also the final round of the U.S. Open an AHEAD U.S. Open hot is an appropriate gift. It features a structured silhouette, waffle-textured 100% polyester performance fabric that and Velcro closure. Personalization is available. Suggested retail is $29. 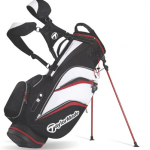 Looking for a new golf bag for dad? 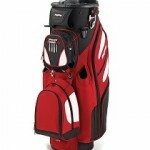 The two new Bag Boy Revolver cart bags feature a 360-degree rotation top, allowing easy access to clubs – the 9½″ Revolver XL ($220) which fits clubs with oversized grips and the 10″ Revolver LE ($240). Everyone can use a new carry bag and the 4.9 lbs. Pure-Lite 3.0 Stand Bag from TaylorMade Golf is one of the best. This bag’s features include a 5-way top with a new integrated handle design, anti-giraffe-at-the- water-hole stand, 8 pockets and full length dividers – $179.99. 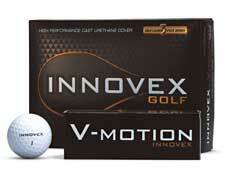 The Innovex V-Motion Tour is a 3-piece ball with cast Urethane cover for spin around the greens and a high speed core for distance off the tee. 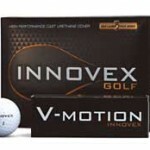 Targeted to appeal to low to mid-handicap players this is a high performance ball at a lower performing ball’s price, $32.95.